PURCHASE, N.Y., August 1, 2013–Mountain Dew today launched ‘Portraits.’ Featuring DEW family all-stars including pro snowboarder Danny Davis,and pro skateboarder Paul Rodriguez,the visually arresting ads are moving portraits that leverage trending technology to showcasesome of the most unique and defining aspects of each individuals’ life. Mountain Dew enlisted the animation experts at Psyopto push the spots into the social media and digital age. Weaving in each star’s personality, Psyopdesigned multiple looping content and complex visual effects to create a distinctly cohesive and dynamic scene while isolating each individual component to move at varying speeds. 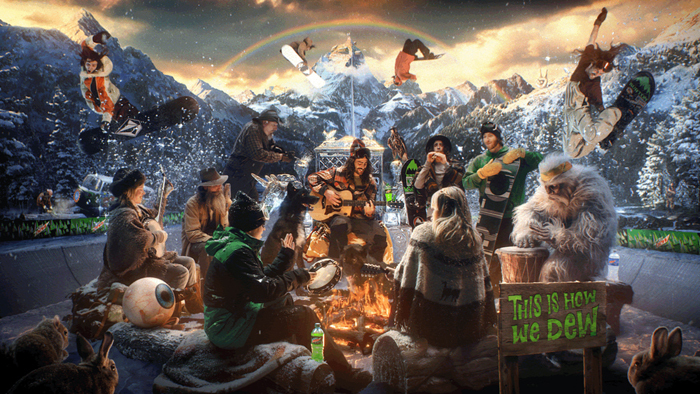 It’s nearly impossible to catch all the unique elements of the ads during the first viewing so, fans can visit www.MountainDew.com/Portraits and delve deeper into the meaning of all the unique components of the ads. Footage taken from the various spots will also be available online as animated GIFs for fans to share through social networks. The :30-second ‘Portraits’ ads are scheduled to launch on August 3 and will air on national network and cable television throughout the summer. Join the conversation at #HowWeDew. PepsiCo is a global food and beverage leader with net revenues of more than $65 billion and a product portfolio that includes 22 brands that generate more than $1 billion each in annual retail sales. Our main businesses – Quaker, Tropicana, Gatorade, Frito-Lay and Pepsi-Cola – make hundreds of enjoyable foods and beverages that are loved throughout the world. PepsiCo's people are united by our unique commitment to sustainable growth by investing in a healthier future for people and our planet, which we believe also, means a more successful future for PepsiCo. We call this commitment Performance with Purpose: PepsiCo's promise to provide a wide range of foods and beverages for local tastes; to find innovative ways to minimize our impact on the environment by conserving energy and water and reducing packaging volume; to provide a great workplace for our associates; and to respect, support and invest in the local communities where we operate. For more information, please visit www.pepsico.com.